Ok, that’s probably not true. Cars are quite useful in many aspects of my life. But, I did bike to work Wednesday-Friday last week and I biked to my parents’ house for Father’s Day. My parents live in Panora. I live in Des Moines. There’s some space in between us — I don’t really operate in numbers, so we’ll just estimate that distance to be somewhere between 40 and 60 miles. But, wait — silver lining! 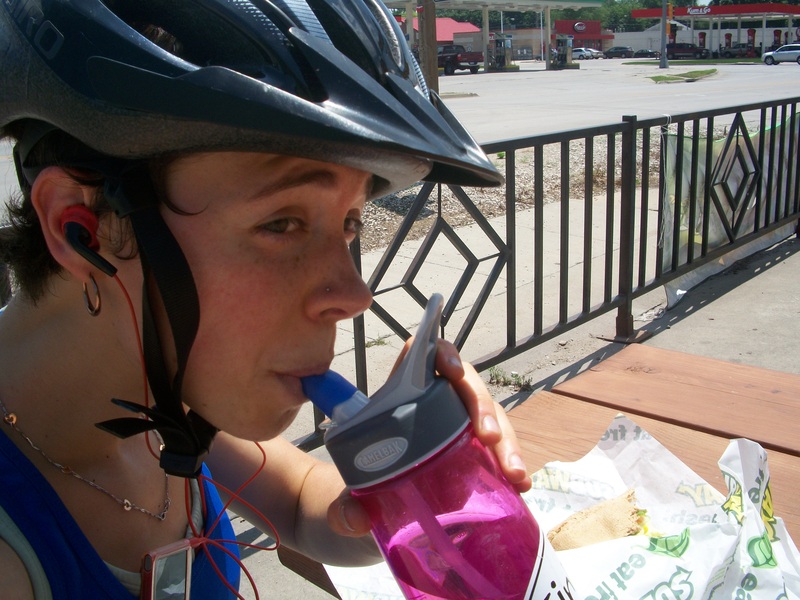 A bike trail totally connects Des Moines and Panora. The little idea seed was planted some time ago to bike to my parents’ house. As I tend to be all talk and no action at times, I decided to take action and bike my short little legs off. First step: planning. This was a two-day adventure, since I also needed to bike back to my house. Luckily, my boss is nice and lets me take vacation days at the last minute (aka: Friday afternoon at about 5:15 when I hatched this plan). Second step: pack. I had to carry my dad’s Father’s Day present with me. Unfortunately, I got him a hardcover book about Iowa ecology. Carrying the book built character. Next year, I’m getting him something with less girth. Third step: find a bike with two non-flat tires. I started my journey on my little blue bike (possibly the friendliest bike ever). However, about 10ish blocks away from my house, I heard the lovely “hssssssss!” of a tire slowly losing life. I walked my bike to the bike shop — it was closed. So, I walked home with my flattie-tire bike and asked Meredith if I could borrow her bike. Here’s where my journey gets somewhat interesting. Meredith is taller than I am. Again, I don’t really deal in numbers, so we’ll just say she’s a lot taller than I am. Her bike is a road bike. She has special bike shoes that clip into her pedals. She has admitted to having difficulty stopping said road bike because the seat gets wedged in a certain area that doesn’t particularly appreciate the insertion of a bike seat. I am short. My bike is a hybrid. This means it has a wider, more comfortable seat and big ol’ pedals that do not require special shoes. My bike is also made for short people. This means I can stop my bike without wedging the seat in the area that does not like seats wedged into it. Also, road bikes go a lot faster than hybrid bikes. This is both a good thing and a scary thing. If I could be described in one word, that word would probably be classy*. If I could be described in two words, those words would be classy AND stubborn. *I kid, I kid! A better word would probably be gassy. Come hell[ishly scary bikes] or high water, I was gonna use pedal power to get my little self to Panora. If any of the neighbors saw me attempt to ride Meredith’s bike for the first time, they probably had a good laugh. I fell off a couple times. They were gentle falls. A smarter person would have given up — but, alas, I am not that person. About 15 miles into my journey, I figured out how to change gears. My trip had slight similarities to the Oregon Trail when I encountered water over the bike trail and decided to ford the “river” [it wasn’t my bike, so I opted to carry the bike and just wade through the deep-ish water — it worked], but my little adventure was a success! I made it to Panora and back to my house — and the area that had a bike seat wedged in it for far too long for two days is recovering. I took pictures of my journey. Enjoy! 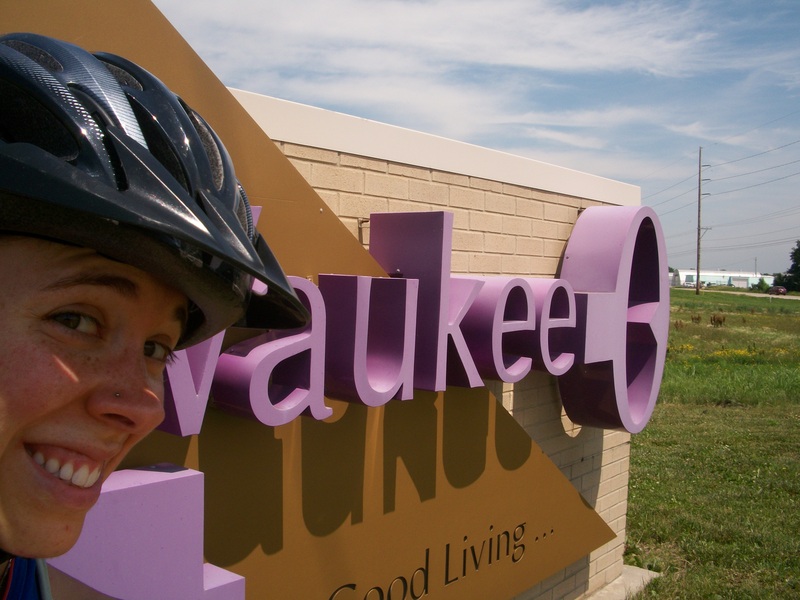 Here I am in Waukee — the “key” to good living (just in case you wanted to read the rest of the sign). Ortonville?!?! 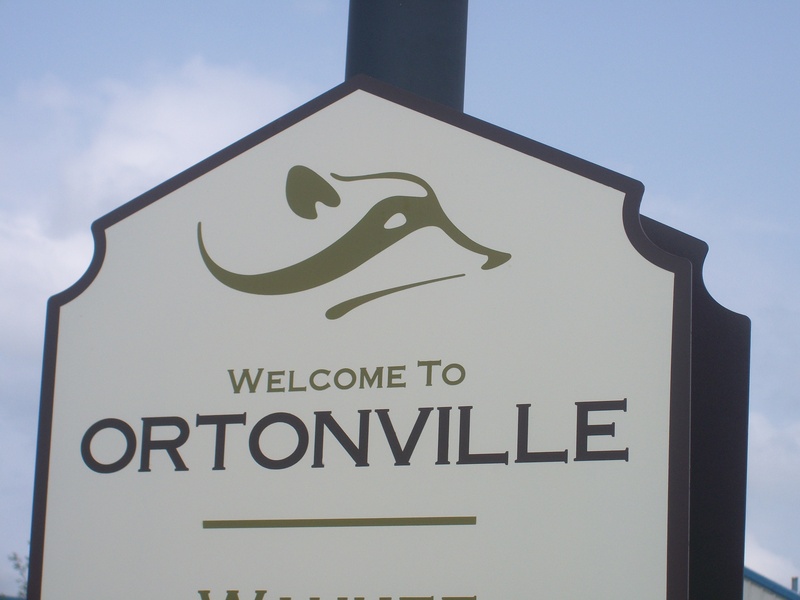 Who knew there was a town called Ortonville? Not me. I liked Ortonville. It consisted of (1) this sign and (2) nothing else. Lunch. I hunted a Subway on the trail. This particular Subway was the slow one in the pack. Look! 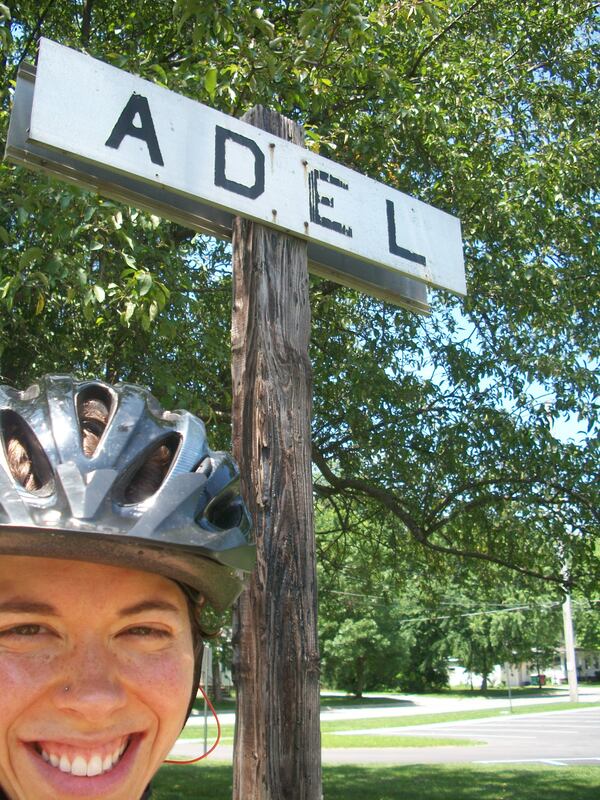 I made it to Adel! Redfield! 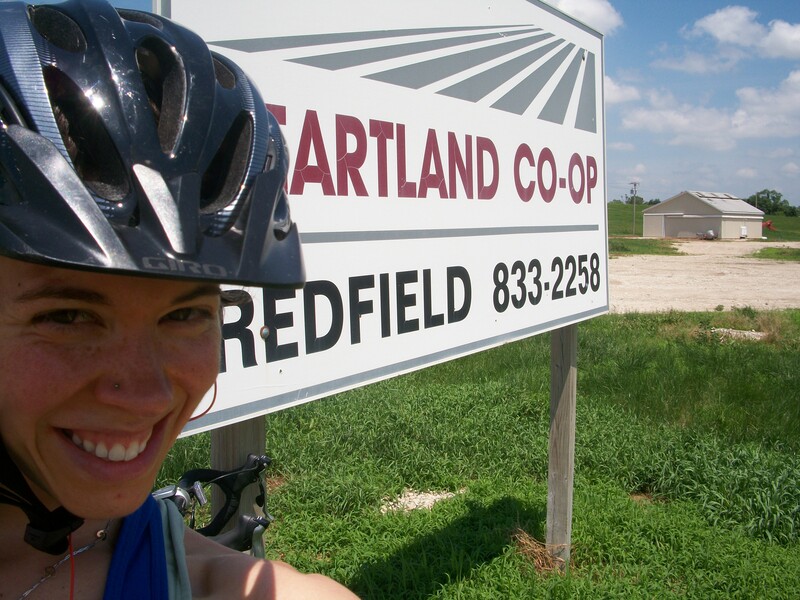 Here’s a little shout out to the Heartland Co-op (or Artland Co-op thanks to my bicycle-helmet head). Linden! 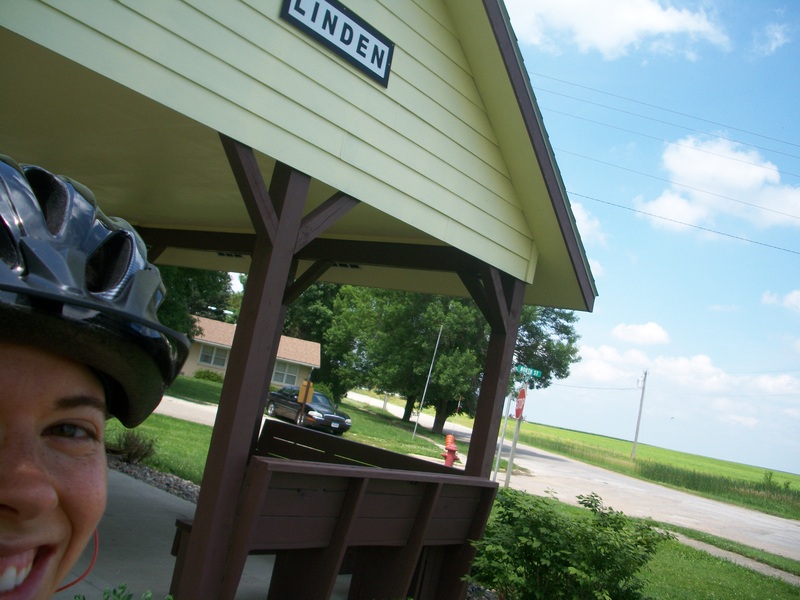 My grandma lives near Linden, and my dad was farmin’ near Linden when I pedaled through, so they stopped to cheer for me. They also brought me extra-cold water and donut holes. They are pretty much awesome. DESTINATION: PANORA! 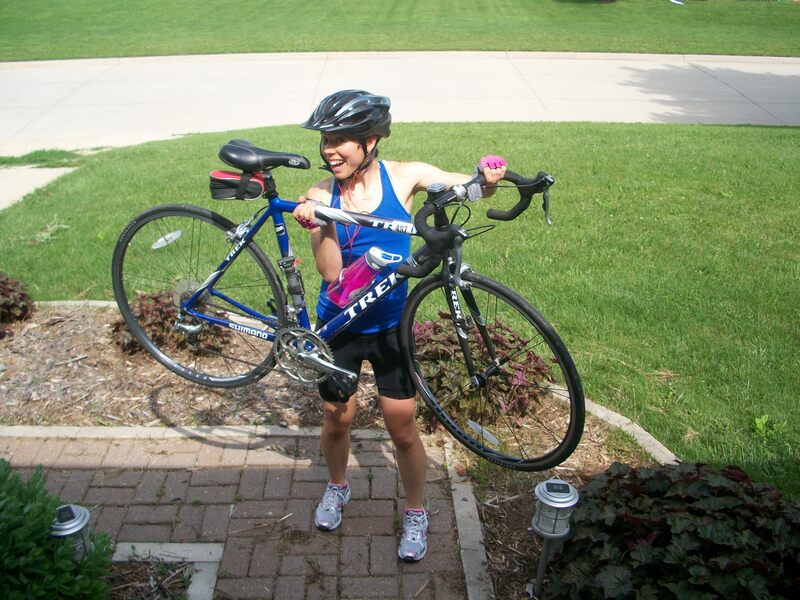 Me, holding Meredith’s bike in victory on my parents’ sidewalk. You’re pretty much amazing. Go you, indeed!